Dholes are intelligent predators that live and work together in packs that range from 5-12 members. This allows them to compete with much larger predators for prey. Exclusive carnivores, dholes eat mostly small to medium deer and wild boar. Often hunting in thick brush and forests, they rely on their keen sense of smell to find prey. Some packs specialize in driving prey into the water. The dhole is highly adaptable and lives in diverse habitats; from dense forests in Thailand, alpine regions of Russia, open grassland steppe in China to thick scrub jungles in India. They live wherever their range has plenty of prey, water and suitable den sites. Dholes are very social, typically living in packs of 5 to 12 with a strict hierarchy. Sharing their range with other carnivores, the pack marks and defends its territory from other dhole packs. They den in abandoned burrows and have litters of up to 12 pups. All members of the pack care for the litter. With fewer than 2,500 in the wild, dholes are endangered. Due to rapid human population growth in Asia, the major threats to dholes are loss of habitat and lack of prey. Disease from domestic and feral dogs is an increasing concern. Dholes have very powerful jaws, but lack long canine teeth for the “killing bite” of other carnivores. Dholes sometimes harass much larger predators, even tigers, in efforts to steal their prey. Asian wild dogs hunt cooperatively, which allows them to bring down prey up to ten times their size. The single-crested cusps on a dhole’s lower molars increase shearing ability to help them rip and consume prey more quickly. The Asian wild dog attacks prey by biting onto its nose, allowing others in the pack to attack from all sides. 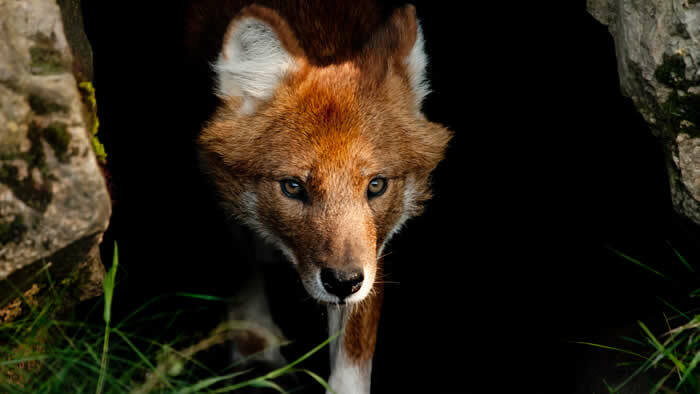 Dholes are an endangered species. There are only about 2,500 individuals left in the wild. Their numbers continue to decline when their habitat is destroyed to make room for farming, and when poachers kill deer (the dhole’s main food source). In some countries, dholes are killed by people who blame the dholes for killing their livestock. 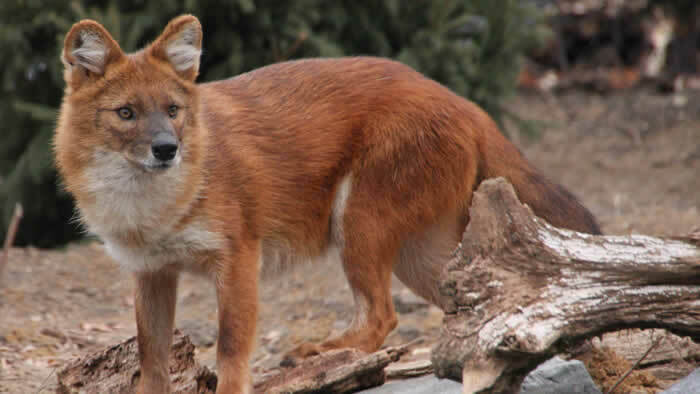 Biologists at the Minnesota Zoo are trying to help the remaining dhole populations in Thailand. They are working with partners at the Smithsonian Conservation Biology Institute to gather information about how dholes use their habitat. Very little is known about dholes in the wild. 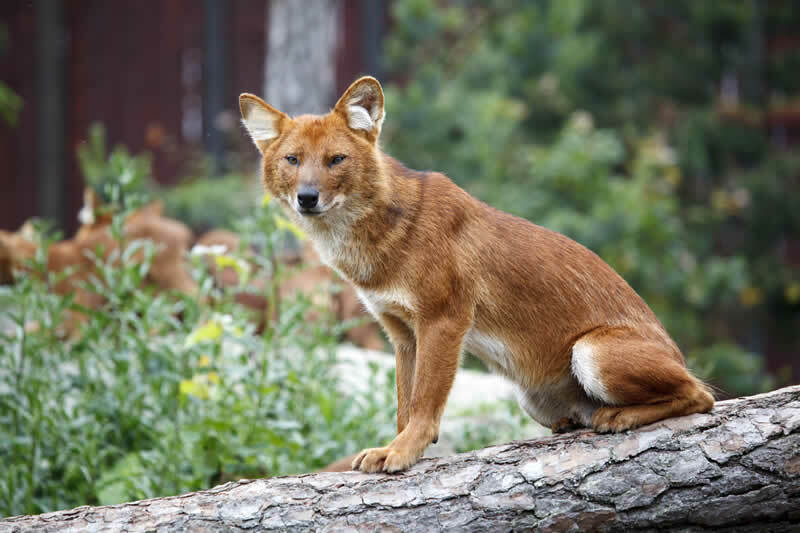 Learning basic information about dholes is the first step to evaluating current threats to dhole populations and developing a management plan to save the species in the wild. Learn more.